How Does An Orchestra Commission New Music? From inspiration to world premiere, a new orchestral commission is shaped by dozens of people along the way. Composers are often imagined as solitary figures, writing music alone before descending the stairs to present their creation to the world. In truth, the process involves dozens of people who shape and influence the music before the first notes are ever played. 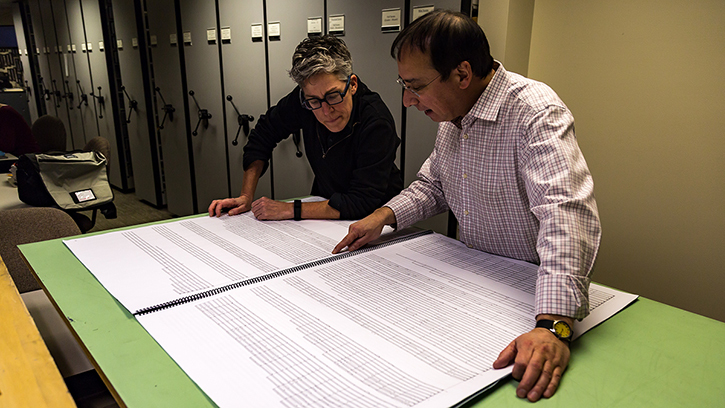 From orchestral librarians to artistic administrators to musicians and funders, a new orchestral work is the result of an intricate network of collaborators. At the Seattle Symphony, Vice President of Artistic Planning and Creative Projects Elena Dubinets is the guiding hand behind the process. Since she began leading the Artistic Department in 2008, Dubinets has presided over more than 50 world premieres by some of today’s most recognized composers, including John Adams, Mason Bates, Anna Clyne, Giya Kancheli, Michael Gordon, Nico Muhly, Gabriel Prokofiev, Chen Yi, Agata Zubel and many others. This year the Seattle Symphony will present the world premieres of four new commissions from Composer in Residence Alexandra Gardner, John Luther Adams, David Lang and Andrew Norman. But the process of commissioning these works began years ago. Music Director Ludovic Morlot and Dubinets work closely together to identify composers who fit the Symphony's mission and vision. Once they agree to approach a composer about a commission, however, Dubinets becomes their primary contact, guiding the music from inspiration through editing and finally into rehearsals with the orchestra. Before the composer sets notes to page, they meet with Dubinets to negotiate instrumentation. "We rarely dictate anything besides approximate length and instrumentation, because we want composers to create their own work," she explains. Once the parts are approved by the library, they are distributed to musicians. The principal string players meet separately to work out bowings ahead of the first rehearsal. Then the librarians copy the bowings into the parts for distribution to the string sections. Finally, the orchestra meets for the first time, usually a few days before the premiere. At most the musicians will have three rehearsals ahead of the performance, totaling an hour or two of rehearsal time. No matter how exact the preparations, rehearsals are a high stakes process for the composer, who must balance the changes they suggest with the limited preparation time. And, at last, the world premiere arrives. The hall fills with people, the lights dim and the orchestra tunes. And then, following years of conversations, emails, rounds of edits and rehearsals, music fills the room. And altogether too soon, the piece dissipates into applause. Listen boldly with the Seattle Symphony and discover new music by Composer in Residence Alexandra Gardner, John Luther Adams, David Lang and Andrew Norman!